This newly listed modern spacious villa, is situated in a quiet cul-de-sac, Is a 2 bedroomed detached property, built in the Vendée style of white washed walls and terracotta tiles. It has a good size privately enclosed garden ideal for sun bathing, with a patio, garage and drive. The villa is all on one level with an open-plan kitchen, dining and living room area giving a spacious feel and allowing the family to enjoy each other's company. The new Ikea kitchen is fully-fitted with a built in fridge freezer, hob and cooker, microwave, dishwasher and a breakfast bar. There is a good size shower room with a wash basin and a separate toilet. The main bedroom has a double bed with bedside tables and reading lamps, and fitted wardrobes. The second bedroom has 2 bunk beds, reading lamps, a pull out truckle bed and fitted wardrobes. A fully-fitted kitchen with built in fridge-freezer, induction hob and cooker, microwave oven, dishwasher and a breakfast bar with 2 stools. There is a table and 6 chairs in the dining area. There is a leather 2 seater settee with chaise longue and a separate armchair. A coffee table, tv table with a tv screen with separate satelite receiver enabling UK satelite programming, and for dvd player. Note - there is no terrestrial television. The bathroom has a wash basin and shower with towel rail and fitted cupboard. There is a separate toilet. There are numerous on and off-road cycle paths that start and end in the village and take in the local area including the towns of Jard sur Mer with its Port and Longeville, the wonderful expanses of beaches at Le Bouil, le Rocher and Les Conches as well as the local countryside of sunflower and maize fields with the odd vineyard thrown in for good measure! There is a washing machine and sink in the garage. Suitable for people of limited mobility as the property is all on one level. As a family, we have spent many years camping in and around the Vendee, enjoying the sunshine, warmth, beaches and relaxed nature of the area. Three years ago we stumbled across the understated Les Batardieres campsite in Saint Hilaire, expertly run by Madame Boussans. This proved the ideal location, being on the one hand close enough for a 6 year old to cycle to nearest beach of Le Bouil, having the amenities of Jard-sur-Mer and Longeville-sur-Mer close by, and set in a quiet rural French idyll. As we explored opportunities to purchase a property, why look any further! The property is a home from home. It is located in a private residential cul-de-sac offering safety and security for children to play. The enclosed garden fully surrounds the property, giving privacy, and offering ample opportunity for the children to let off steam. The drive offers off road parking for two vehicles, while trailors, bicycles, etc … can be stowed securely in the generous garage. Inside, the property has been newly refurbished throughout, with a built in 'Ikea' kitchen with a feature breakfast bar, and has a full complement of amenities including dishwasher, and washing machine in the garage. Location: Within cycling reach of great beaches, great road and trail cycling and walking from the house. Local amenities include, bar, and grocery store, weekly pizza van, during the season use Les Metaires campsite restaurant. The bathroom has a wash basin and shower with electric towel rail and fitted cupboard.. There is a separate wc. Linen is available at a cost of £35. This includes 2 x tea towels and a bath mat. If you intend to bring your own linen, the double bed measures 140 x 200 cm and the single beds are 90 x 200 cm. A new fully-fitted IKEA kitchen with built in fridge-freezer, induction hob and cooker, microwave oven, dishwasher and a breakfast bar with 2 stools. There is a table and 6 chairs in the dining area. There is both a breakfast bar with 2 stools, and a table and 6 chairs in the dining area. Outside on the patio, there is also a table and six chairs with separate cushions. 32" Samsung, for DVD and satelite reception. No terrestrial reception. Satelite fitted, with UK Freesat satelite reception. Mini HiFi with AUX cable and connection for MP3/ iPod connection. USB compatible to support iPod. A range of books available. Selected CD's available, and aux connection through HiFi. The patio/ terrace is located directly infront of the double opening sliding glass doors, and have the following furniture: Patio table and 6 chairs with parasol, 2 deck chairs and 2 sun loungers. The villa is on one level. It should be noted, access is via a step and across some circa 2m of gravel. Set in the historically fascinating, rural village of St Hilaire la Forêt, the house is only 4.5km from the nearest beach. The village square, just a 6 minute walk away, boasts a church, the Mairie, a pétanque alley, and grocery shop. The grocery shop sells fresh baguettes and croissants every morning. The excellent Stone Age Museum ‘Le Cairn – Centre de la Préhistoire’, is also situated in the village, and inspires a visit to the time of the Stone Age through a variety of children's hands-on activities, exhibits and information about the local monolithic sites of which there are a number. There are numerous on and off-road cycle paths that start and end in the village and take in the local area including the towns of Jard sur Mer with its Port and Longeville, the wonderful expanses of beaches at Le Bouil, le Rocher and Les Conches as well as the local countryside of sunflower and maize fields with the odd vineyard thrown in for good measure! A lovely holiday home perfectly located in the Vendée. After searching for some time for a holiday home that offers good facilities as well as being close to the coast we decided on Andrea’s property and were not disappointed. 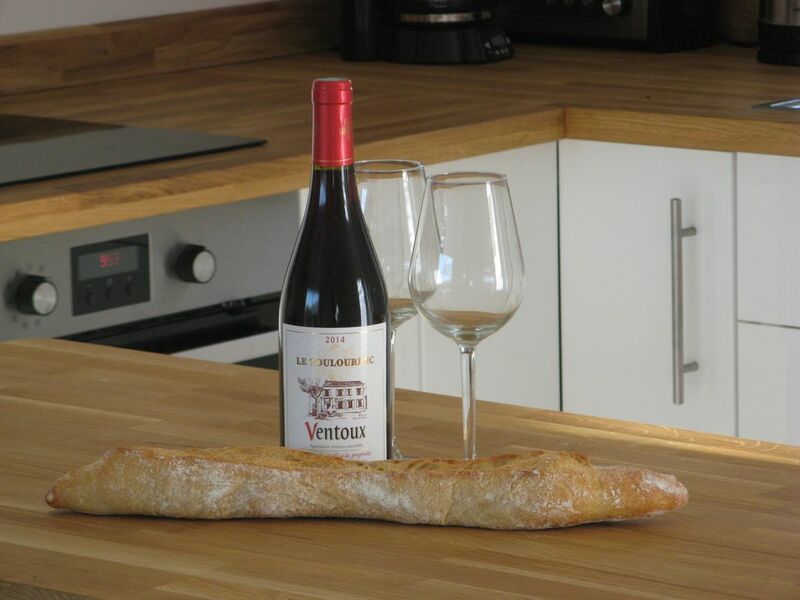 The house is located in St Hilaire la Forêt, a pretty village set just back from the coast offering a more relaxing and authentic French experience rather than staying in the swathe of holiday villages right on the coast. The house is far better equipped than many holiday apartments that we have visited, it is spacious, nicely furnished, and has a lovely garden. If you like cooking then the kitchen is a real treat and has all that you will need to cater for a family, with the choice of large dining tables both inside and out. There is also a secure garage that is absolutely great if you cycle and take bikes on holiday with you. Shopping in the area is well provided for, we stocked up at the large 'Super U' supermarket in Jard-sur-Mer which we preferred as it has a great selection of fresh foods and wines, but there is an equally large supermarket in Longville-sur-Mer, both are only a short car drive away. There is also a small shop in the village for basic items. Once settled in we took to our bikes and quickly worked out the best cycle trails to the beaches, the cycle routes start next to the 'Mairie' in the centre of the village. Twenty minutes or so of cycling through fields of sunflowers brings you to beautiful Atlantic beaches such as Le Bouil, really great for swimming, paddle boarding and searching out crabs in the rock pools at low tide! We also headed down the coast a little way by car to visit the popular seaside town of La Tranche-sur-Mer, I learnt to windsurf here many years ago and it still has an excellent nautical centre with great windsurfing and sailing facilities. La Rochelle airport which is served by several UK operators is only a little over an hour's drive away so Granny was able to visit us whilst we were staying. It is also an easy journey to the fascinating Ile de Ré, the ports of La Flotte and Saint-Martin-de-Ré on the island as well as the lighthouse at the westernmost tip are really worth a visit if you have time, although it’s best not to cross the bridge on a Saturday in the high season as you will queue in traffic for a very long time! So all in all a highly enjoyable stay in a lovely holiday home with so much to see and do in the area for a two week holiday. We really look forward to returning! A very nice villa,very comfortable,nicely furnished,Super kitchen.The villa is perfectly situated to explore the surrounding area ,our particular favourite is Jard Sur Mer ,but is near to many places. the villa is in a lovely village, with a shop and a local bar.we loved our stay We cant wait to go back! Linen including Kitchen Towel can be purchased separately at £100 per fourtnight. It is assumed that the property will be left both clean and tidy and in the manner a customer would expect. If a cleaning service is required, this is charged at £50 per hour.